Prescott, Arizona is known as Everybody s Hometown, because retirees often find something here that reminds them of where they grew up. For many, it is the historic Yavapai County courthouse, tree-lined plaza and surrounding shops in the downtown area. To others, it is the overall small-town charm and hospitality. People are friendly here, and you will notice it no matter where you are in the community. There are a variety of retirement living options that include active adult retirement communities in Prescott, luxurious golf course resorts and beautiful homes near the heart of Prescott s historic downtown area. Prescott has many Victorian style homes in the older parts of the city that help it maintain a special charm that is unique to this community. Unlike the larger retirement destinations of Phoenix and Tucson, Prescott does not have an abundance of large-scale active adult communities but there are several age-restricted active retirement communities in Prescott and the surrounding valley. Many retirees who move to the area choose one of the several magnificent master-planned communities. Some of which are gated and include clubhouses, golf courses and planned social activity. 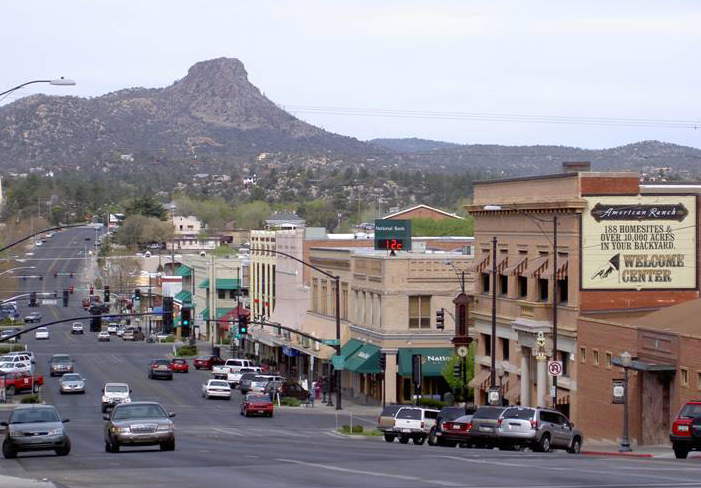 Prescott is known as Arizona s mile high-city due to its elevation at 5,368 feet above sea level. This elevation, scenic views, and surrounding Prescott National Forest will give you a feeling of living in the mountains. Prescott s location provides it with a mild four-season climate. Due to the breezes coming off the adjacent Bradshaw Mountains, summer temperatures remain moderate, with daytime highs averaging in the 80s and nighttime lows in the 50s. Prescott s winters are just as moderate with daytime temperatures generally in the 50s. The area receives an average annual snowfall of 25 inches. While the area s springs may be a bit breezy at certain times, its autumns are beautiful. Prescott hosts annual events such as Frontier Day, The World s Oldest Rodeo, the Bluegrass Festival, Earth Day, Tsunami on the Square, art festivals, A Cinco de Mayo celebration, Shakespeare Festival, Navajo Rug Auction, World Largest Gingerbread Village, Prescott Film Fest, Folk Art Fair, parades, the Acker Music Festival, the Cowboy Poets Gathering, the Prescott Highland Fames and several marathons and mountain bike races. Prescott is also known as Arizona s Christmas City because of its annual electric parade after Thanksgiving and the Christmas Parade before the lighting of the courthouse plaza the first Saturday in December. Prescott has unlimited opportunities for outdoor recreation from parks and lakes within the city limits to the 1.25-million acre Prescott National Forest surrounding the community. Backpacking, camping, hiking, mountain and street biking, golf, tennis, hunting, fishing, boating and swimming are favorite activities among Prescott s retirement population. The city has an active Parks and Recreation Department, which manages some of the most beautiful natural and man-made parks in the Southwest. A new adult center recently opened for active seniors which provides various organized activities. Prescott Public Library, known as "Prescott's Living Room," is a lively community center offering traditional and non-traditional library programs and services to residents of Yavapai County and beyond. Through the Yavapai Library Network, its online catalog offers access to over one million books, movies, audio books, magazines, electronic resources and more. Consult thousands of full text magazines and journals or learn a foreign language through the online research databases. Thoroughbred and Quarter horse racing take place Thursday through Sunday from Memorial Day through Labor Day at Yavapai Downs. The Sundogs are a minor league hockey team in Prescott Valley. Their new arena also plays host to many cultural events throughout the year. Prescott and the surrounding area have an overall cost of living index that is rated at 107.2, which is 7.2 percent above the national average of 100. The housing component of the composite index is 119.2, groceries are 103.4, transportation is 102.1, healthcare is 100.2 and utilities are 90.6. People who move to Arizona will enjoy low property taxes, no taxes on groceries and prescription medications, and no estate taxes. Housing prices tend to run somewhat higher than the national average. But like many areas around the country, the recent housing correction has made the area more affordable. On the national housing price index, Prescott was rated as 119.2 compared to the national average of 100. This means that home prices in Prescott average 19.2 percent more than the national average. Prescott has easy accessibility to some of the best medical care in Arizona. In addition to the full spectrum of health services provided through physicians, dentists, chiropractors, optometrists and many others, Prescott is home to the Yavapai Regional Medical Center West and the largest VA medical center in the region. On top of that, the city is near Yavapai Regional Medical Center East, the Del E. Webb Outpatient Center and Mountain Valley Rehabilitation Hospital all in Prescott Valley.